Last night after a long week of sickness, deadlines, and stress, a bowl of hot soup sounded like the perfect meal. I decided to make a recipe passed on to me from the awesome team at Idahoan. Talk about a Supermom Trifecta meal! (Cheap, Easy, and the Kids Will Eat It!) The Idahoan Southwest Tortilla Soup was delicious, and was just what my family needed! It was tasty, hearty, delicious, and quick and easy to prepare. This recipe also happens to feature my favorite flavor of Idahoan potatoes….Southwest. I love the slightly spicy and smoky flavor of the Southwest potatoes. They definitely aren’t your grandma’s potatoes! Try them out as a side dish the next time you prepare dinner! Here is what you will need to make the soup! Start by chopping your onions and garlic. Sweat the onions and garlic in 2 T olive oil, until soft and translucent. While your onions and garlic are sauteing, cook your chicken! (If you have pre-cooked chicken, you can skip this step! 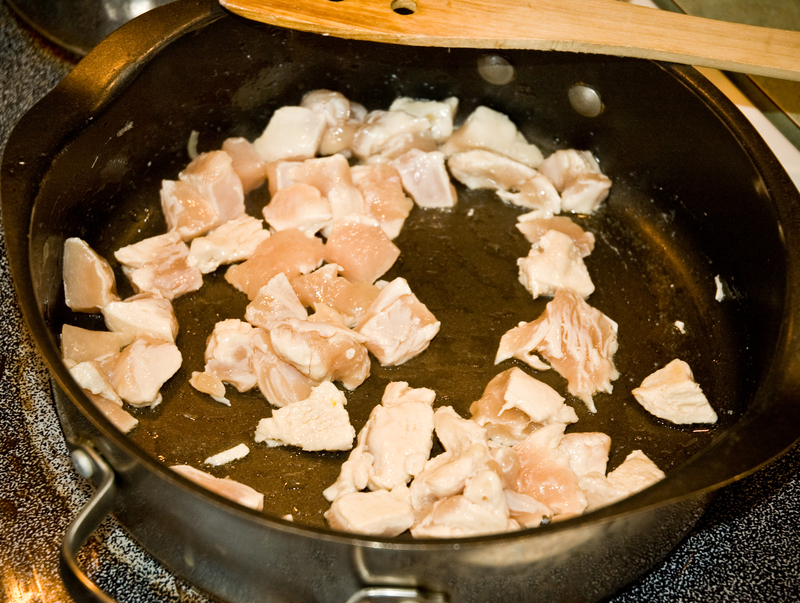 Supermom recommends cooking chicken in large batches when you have extra time, and freezing the chunks or pieces in 2 cup increments. The frozen chicken is easy to pull out and defrost when you need it, and can save you lots of time in the kitchen!) I used one large breast for this soup. I diced my chicken and cooked it in just a bit of olive oil. 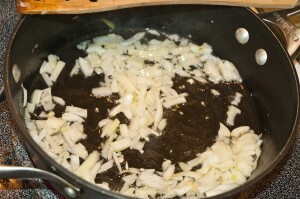 Once your chicken is cooked through, add in your onions and garlic and mix together. 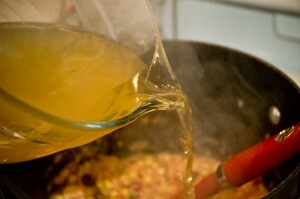 Then, you will add in a can of corn (I did not drain my corn), a can of black beans (make sure to rinse! 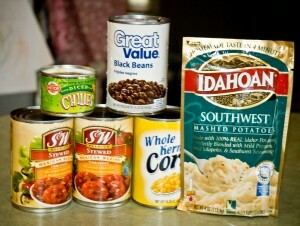 ), a can of diced green chiles, 2 cans of diced tomatoes (I used tomatoes with Mexican spices as recommended by the Idahoan team), and the package of unprepared Southwest Idahoan potatoes. Next, I added my chicken broth. I chose to heat my broth up, to better incorporate the ingredients together. If you cannot find a 32 oz container of broth, you can simply use 4 cups of your favorite broth. Add the broth to the pot, and stir well. 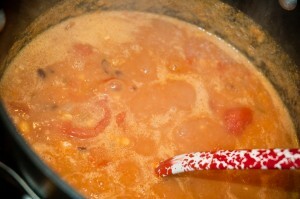 Allow your soup to simmer on low heat for 45 minutes. Taste and adjust your seasoning accordingly. The team at Idahoan likes their soup hot, so they added some hot salsa to their soup. My family prefers things a bit more mild, so we left the soup as is. I thought the seasoning from the potatoes really gave the soup a great flavor, and did not find that I needed to add any additional salt or spices. The soup had the best texture, and was so beautifully seasoned. The potatoes really gave the soup great flavor, while serving as an excellent thickening agent. 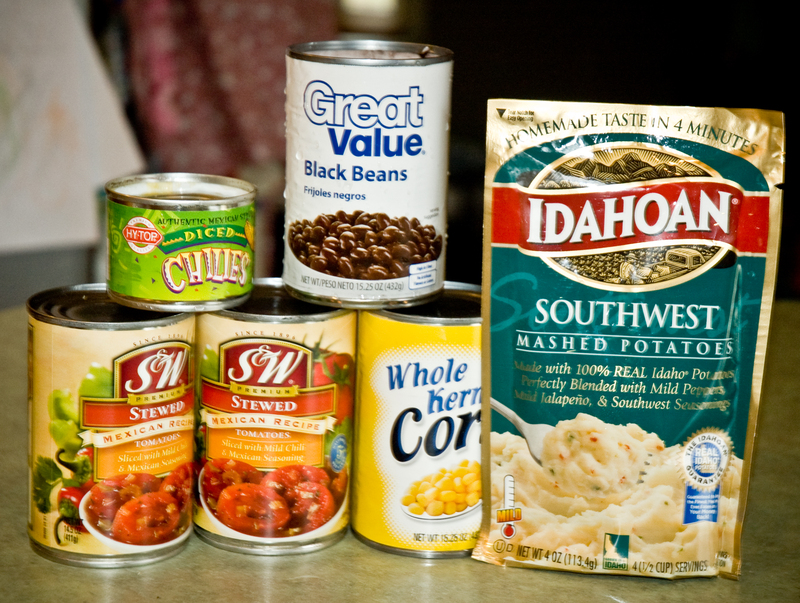 Using Idahoan potatoes in your soup recipes is an EXCELLENT idea, and I hope more of you will come up with some creative ways to incorporate them into your favorite recipes. Here’s the important part when serving: Crunch up tortilla chips on bottom of bowl, ladle soup, top with diced avocado, shredded cheese, chopped cilatro, a dollop of sour cream and chopped green onions. The tortilla chips on the bottom of the bowl really gave the soup another dimension of flavor. I also had this soup again today for lunch without the chips, and really enjoyed it that way as well. It reheats very well, and there will be enough for leftovers. (The recipe makes a lot! 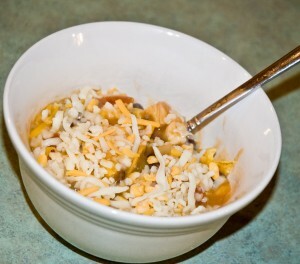 This is a great recipe to feed a crowd, or to bring to a family who may need a meal!) This soup was incredibly good, and I hope many of you will try this recipe! I served the soup with some nice crusty sourdough bread, but it would also pair nicely with a fresh salad. Add it to your menu planner for the coming week! If you’ve never cooked with Idahoan potatoes before, this is a great place to start! Make sure to add them to your grocery list for the week! You will NOT be disappointed! 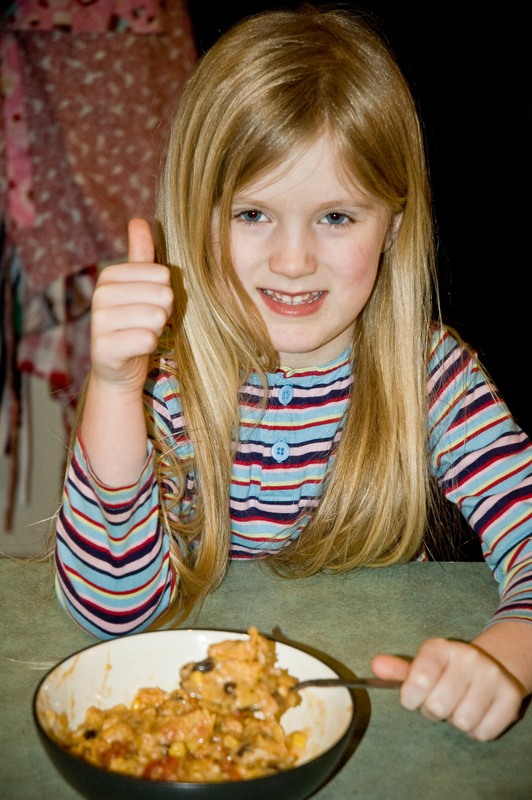 This soup even got my four year old daughter’s stamp of approval! I think this is a soup your whole family will enjoy! I encourage all of you to try out this amazingly delicious recipe from Idahoan potatoes. You probably already have most of the ingredients on hand, and can typically find the potato pouches for around $0.88 at the store! You can’t beat that! Happy cooking everyone!